Scrapping Mommy: Tea/Tee Time - My Creative Time Release Week!! Tea/Tee Time - My Creative Time Release Week!! It is time for another FABULOUS Release Week at My Creative Time. This newest release is so awesome!! I can't wait to share my card with you. I used the new Tea Party stamp set from My Creative Time for the sentiment. The tee is cut with my Cricut Mini from Everyday Paper Dolls and the ball is just a basic circle (from George and Basic Shapes) that I embossed with my Cuttlebug and Polka Dots embossing folder. The tea cup is cut from Love You A Latte cartridge and embossed again with my Cuttlebug and a border embossing folder. The base is cut from Elegant Edges that I altered in Cricut Craft Room with a rectangle at the top to take off the top scallops. I also did this for the shadow. I added some stitching from my sewing machine and a little bit of Flax colored bakers twine from The Twinery. Emma will randomly pick & announce all winners on Friday, March 16th during the blog hop release happening @ 12:01am PST in her video! GOOD LUCK! Cardstock, patterned paper, ink: Stampin' Up! Love the embossing on your card. Thanks for sharing! O my goodness this card is super cute!! I love how you created the golf ball very creative, love the twine on the tea bag. Can't wait to see the rest of the not so sneak peak projects!! I always loves seeing your creations, Amy! They're just gorgeous, and this is no exception! What a great way to use this sentiment!!! I love the little tea cup! So sweet. I love all the little details. Its beautiful! YAY! Someone else who sews on her cards and (maybe) scrapbook pages. Love it! Amy ~ this is so BEAUTIFUL and funny at the same time! GREAT way to use the sentiment! Love all the sewing, the edges and fabulous idea to use the embossing folder for the ball! GREAT JOB! 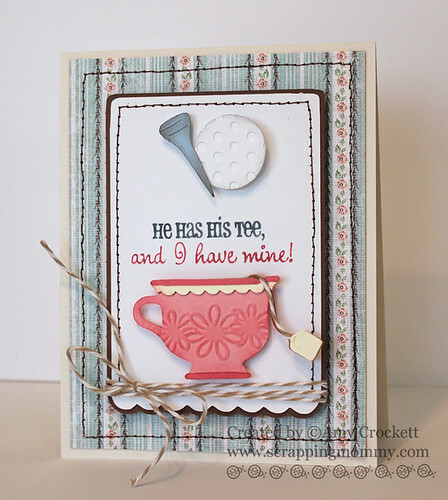 luv ur card & great idea for someone that golfs/likes tea..
What a great card Amy...I love how your directions are so detailed and how you used the polka dot Emboss folder...looks so real...and I never thought about using a border emboss folder the way you do...how genius. this is so awesome Amy!! love the LO of your card and LOVE how you used these new releases!! Super cute card, Amy. The stitching really sets it off! As a tea-drinker, I think this stamp set is a must-have! Great play on words! I love your card!! Amy this card is just so beautiful!! 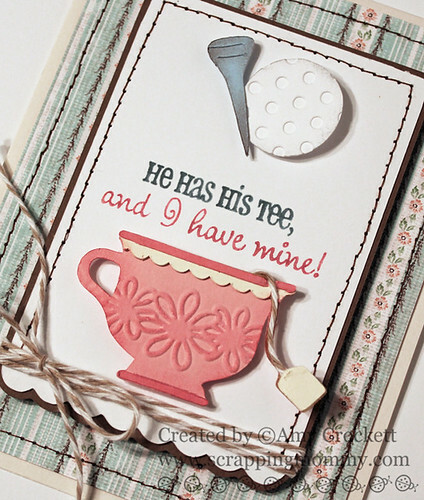 I love the way you added the golf tee and love the cup with the little paper bag tag!! I love your card. You're very creative. Thank you for sharing. Hi Amy, I love this card, the sentiment is adorable lol..and I"m a big lover of tea, so great card! How clever! This phrase will come in so handy. Perectly fits many occasions. You did a really nice job. I love the coral colors. Love this card. The embossing on the cup is so perfect and eye-catching!! I love everything about this card... the colors, the embossing on the tea cup, the stitching, the tea bag, all the fine details! This is really an awesome card Amy! Very cute card! Love the stamp you used on it. Your card is adorble!! I love the tee and ball, so realistic looking! The tea cup is adorble and I just love the sentiment! Your stitching looks great!! Oh Amy this is sooo cute, love the his and her idea. lovely colors and embossing. I love your idea to emboss the cup...so pretty. The twine on the teabag tag is perfect. Great job! Hi Amy, Wow you did a lot of great things. My Fav would be how you altered the base of your card. And such a great ideal to use you Cuttlebug to emboss the gulf ball and tea cup. Super cut Thanks for sharing AJ! Beautiful card. The twine coming out of the cup is a great touch! Genius to use the dots embossing folder to make the golf ball. Thanks for sharing. Really beautiful card, love the embossing on the tea cup it really makes it stand out. Love your card. I think it's cool that you used your cuttlebug to put the dimples on the golf ball. The stitching with the sewing machine is great. I like your background paper too. Beautiful card love your stitching and embossing. love this card! these colors are so nice together! I love your card and the pastel colors that you used!!!! Great card, thanks for sharing. Omg Amy this is super cute:) I love the paper and all the detail you added to your card, like the embossing and stiching with your sewing machine. Great sentiment for your tea card! I just love your card. The golf ball and tee to go with the sentiment are just perfect. Great card!! Thanks for sharing the cute idea! You have done it again! What a cute card! I love the embossing and twine! Great Job!! This is so great!!! I almost did something similar. Love how yours turned out. The golf ball and tea cup are perfect!!! So cute, love the sentiment. Cute, love your tea cup. OMGOSH! Your card is so cute! You did an awesome job! Love the new stamp sets! Thanks so much for sharing! You did a great job showcasing these new stamps. Great card! Super cute card!!! Love the colors!! what a super duper card for hubby! It definitely is what happens at our home. I love the way you used different elements and media to create your card. TFS! I just hd to giggle when I saw your card. So funny and cute.I love how you designed the tea bag. Very cute card! Thanks for sharing and for the opportunity to win. Amy, this is so cute, I love it! Great combo of his & hers! TFS! Amy, I love your cards!! They are so cute. Thanks!! Sandy C.
An amazing card...so pretty! Love the teacup! Love your little sense of humor card....got my chuckle for the day! Thanks for sharing with us all! Such a clever card, just love the sentiment with the die cuts. I love it! Beautiful card, Amy! Love the embossed tea cup!! This made me smile. I love the play on words card. Great job w/ the golf and the tea pot love it. You are so creative!!! I love how you can alter things around to suit your purposes. Thanks for the inspiration!